She love to paint elegant women, in beautiful clothes, in glamorous settings. Bridget Davies was trained at Bretton Hall, University of Leeds where she gained a 1st class BA in Fashion and Textiles. After a spell of teaching fashion and fashion illustration in Milan, she worked in the fashion industry for several years as an embroiderer and fashion designer. After several years living abroad she returned to England and to her first love, painting figures and illustrating fashion. 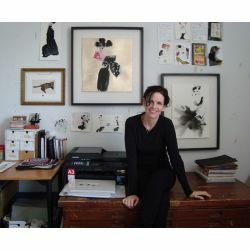 Since then, she have evolved into a successful freelance artist, and create from her studio in Kent. She is a published artist, with greetings cards and framed prints of her work being sold both through online outlets and through stores and shops such as John Lewis and The Shard where examples of her work can currently be seen. In addition her Heavy Metal paintings have also been used by the well-known store Anthropologie on a range of desert plates and serving platters, both in Europe and the United States.